Underneath the Analytics button there is a list of publications that are linked to this publisher. Pressing on any of the publication buttons will open with the overview page for that publication like shown below. In the top left of this screen there is a list of users showing the most recent added users first. To the right of the users there is publication information, including a logo that's shown when opening a VMS. Replacing a logo can be done on this page by pressing the upload & save new logo button. At the bottom of the screen are the number of clips uploaded on a monthly basis (Media Created) as well as the total number of clips on disk (Media Stored) shown. Pressing the Users tab will show the users screen like in the image below. Pressing the Add User button at the top right of the screen will show a screen similar to the picture below. Fill in the data for the user, like email, first name, last name. Username will be changed automatically. Select gender and select roles for this user. When the password and confirm password fields are not filled in a mail will be sent to the new user to the provided email address. If no mail should be sent, provide a password for the new user. Note: Users without any roles cannot be added to the publication. Checking a box will add that role to this user for the publication instantly. Unchecking a box will remove that role. Note: When the last role has been removed, the user that belongs to another publication will disappear from this list. A user can be added again by using the Authorize user button. To hide the checkboxes again, press the Done button. Pressing the detach button will remove the user from the current publication. This button will not remove the user from it's own publication. Pressing the Encoding tab will show a screen like in the image below. This is an overview of all the encoding profiles in use at this moment for this publication. An encoding profile is used to convert a video to different format, so with multiple formats they can be played on multiple devices. Pressing the Players tab will show a screen like in the image below. This is an overview of all the players that can be selected in a playout. Pressing the Custom fields tab will show a screen like in the image below. These fields are used to add extra metadata to a mediaclip for usage in an external system or other specific usages. Most users will not have the need for a custom field, and we strongly advise to contact support@bluebillywig.com to see whether this is the way to solve a problem that might pop up. Custom fields can be seen in the VMS mediaclip details screen underneath the title, description, etc fields. This is the name of the field, which is shown in the VMS. Field types can be selected by clicking on the Type combobox. Normal text field to input alphanumeric text with spaces, single line, like the title field. Normal text area to input alphanumeric text with spaces, with multiple lines, like the description field. When the checkbox Enter-separated multivalue textarea is checked this area can be used to create a list of enter separated values, like the tags field. Box to store a true/false value. 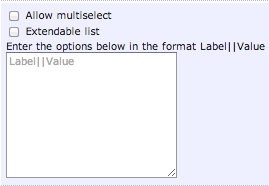 This is a list box from which to select a value. When the Allow multiselect is checked, it is possible to select more than one value from this list. There are two ways to use this list box, by using predefined values or by adding values to the list in the VMS. Predefined values will need to be inserted like this: label||value so label and value separated by 2 pipe symbols. To use dynamic values check the Extendable list checkbox. Adding dynamic values is done by inserting them in the list box in the VMS. It is not possible to use both, so it's either possible to use predefined values or dynamic values. Relation is a box to relate a media clip to the current mediaclip. The type options of relation are shown in the image below. 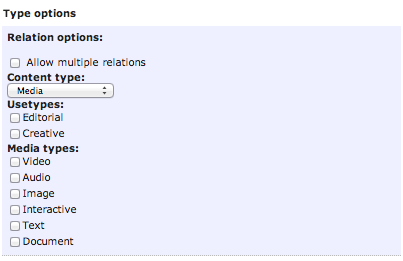 The Allow multiple relations checkbox will allow for multiple related mediaclips. At the moment there's only one content type and that is Media. The Usetypes will define from which bucket the mediaclips can be selected. That's either the clips or the creatives bucket. Select at least one of the Usetypes to be able to relate a mediaclip. The Media types will allow the selection of different mediatypes, like video, audio, image, interactive, text and document. Select at least one of the Media types to be able to relate a mediaclip type. Note:Selecting none of the Usetypes and Media types checkboxes will prevent users from selecting a media clip. This is a date box which will show a calendar to select the date to insert in this field. This is a color picker box to select a certain color. This field allows for selection of a mandatory field. Mandatory means that it will definately have to be filled in otherwise the mediaclip cannot be saved. Pressing the Advanced mode button will reveal some more configuration options. This is the name of the field type, this is something a user will ordinarily will not change as this is an internal value. Normally a field is visible in the vms, to make it a hidden field in the vms, set Visible to no.